This slot is based on the classic Jules Verne novel 20,000 Leagues Under the Sea and is a game that will resonate with fans of the 1954 Kirk Douglas movie adaptation too. This 5-reel, 9-payline slot from online casino slot game developer Amaya has an underwater theme and echoes the tone of The Life Aquatic with Steve Zissou. The symbols in 20,000 Leagues are all based on the Jules Verne novel. There is a shark, a submarine, treasure chest and Captain Nemo himself who doesn’t look like James Mason but still wears the famous captain’s hat and beard. There are interestingly two symbols on the reels that act as the Wild. The submarine symbol appears on Reels 1, 2, 4 and 5 and will substitute for all other symbols except the 20,000 Leagues logo Scatter to complete winning combinations. 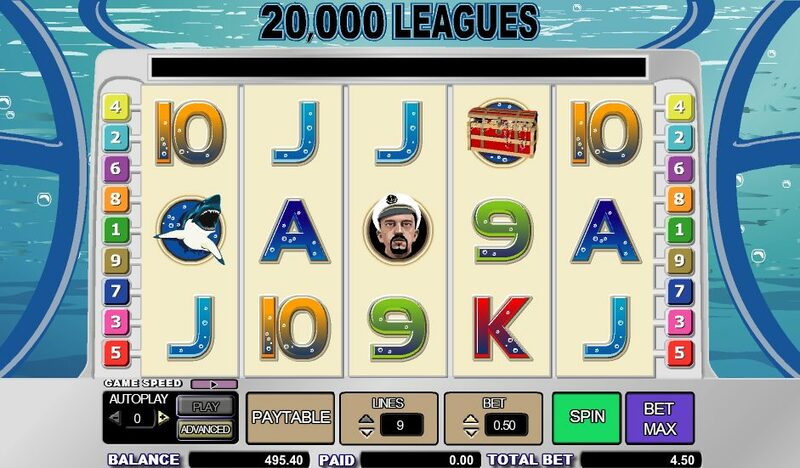 The 20,000 Leagues logo is the slot’s Scatter icon but also has Wild powers. It appears on Reel 3 and will substitute for all other symbols to complete winning combinations. 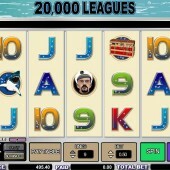 The 20,000 Leagues logo Scatter is also the key to triggering the Free Games Bonus. If one of the submarine Wilds appear at the same time as the 20,000 Leagues logo Scatter then this will trigger the Free Games Bonus. You will be awarded 10 free spins for every submarine symbol that appears on the reels when the Free Games Bonus is triggered. There is also a 2x multiplier applied to all wins gained during the free spins. It is also possible to re-trigger the Free Games Bonus at any time during the free spins. Slots players that have already enjoyed other underwater and aquatic slots such as the visually sterile Subtopia by NetEnt or Amaya's Captain Nemo slot will undoubtedly love this effort. It brings back childhood memories for me personally of staying in on a rainy Sunday afternoon, watching the 1954 movie adaptation on television. It is this sense of nostalgia that it creates that could make it popular with a lot of players.